Information on organic specialty seed production is not as readily available as information on commodity seed production, conventional seed production, or vegetable production. However, there are some new organic specialty seed production publications available from Organic Seed Alliance and Saving Our Seeds listed below. While all of the information in conventional seed production guides may not be applicable they may be useful sources of information on crop biology, seed production strategies, and the important pests of a specific crop. A good starting point for production in the Western Region is the series of crop-specific PNW Extension bulletins listed under “Print Resources” below. Principles and practices of organic bean seed production [Online]. J. Navazio and M. Colley. 2007. Organic Seed Alliance. Available at: http://www.seedalliance.org/uploads/pdf/BeanSeedManual.pdf (verified 11 Mar 2010). Principles and practices of organic radish seed production [Online]. J. Navazio and M. Colley. 2007. Organic Seed Alliance. Available at: http://www.seedalliance.org/uploads/pdf/RadishSeedManual.pdf (verified 11 Mar 2010). Principles and practices of organic spinach seed production [Online]. J. Navazio and M. Colley. 2007. Organic Seed Alliance. Available at: http://www.seedalliance.org/uploads/pdf/SpinachSeedManual.pdf (verified 11 Mar 2010). To access the publications listed below, go to http://www.savingourseeds.org/publications.html, scroll down to the bottom of the home page, and click on the publication you wish to read. You must provide SOS with your name and contact information. Organic Brassica seed production guide [Online]. J. H. McCormack. 2005. Saving Our Seed. Organic tomato seed production guide [Online]. J. H. McCormack. 2005. Saving Our Seed. Organic pepper seed production guide [Online]. J. H. McCormack. 2005. Saving Our Seed. Organic Cucurbit seed production guide [Online]. J. H. McCormack. 2005. Saving Our Seed. Organic bean seed production guide [Online]. J. H. McCormack. 2005. Saving Our Seed. Basic concepts of seed production and seed generation [Online]. Undated. Cornell Public Seed Initiative. Available at: http://www.plbr.cornell.edu/psi/Basic%20Concepts%20of%20Seed%20Productio... (verified 11 Mar 2010). Seed production and variety development for organic systems [Online]. K.L. Adam. 2005. ATTRA. Available at: http://attra.ncat.org/attra-pub/PDF/seed_variety.pdf (verified 11 Mar 2010). Seed production and seed sources of organic vegetables [Online]. J. Bonina and D. Cantliffe. 2005. University of Florida. Available at: http://edis.ifas.ufl.edu/hs227 (verified 11 Mar 2010). Weather-related risk guidelines for dry-seeded specialty seed crops [Online]. M. Colley, M. Dillon, and F. Morton. 2006. Available at: Organic Seed Alliance. http://www.seedalliance.org/uploads/pdf/weatherrelatedriskguidelines.pdf (verified 11 Mar 2010). Crop profile for cabbage seed in Washington [Online]. L. J. du Toit, C.R. Foss, and L.J. Jones. 2000. Washington State University Extension. MISC 358E. Available at: http://www.tricity.wsu.edu/~cdaniels/profiles/CabbageSeed.pdf (verified 11 Mar 2010). Crop profile for spinach seed in Washington [Online]. J.M. Thomas, C.R. Foss, and L.J. Jones. 2005.& Washington State University Extension. MISC 357E. Available at: http://www.tricity.wsu.edu/~cdaniels/profiles/SpinachSeedPM2.pdf (verified 11 Mar 2010). Crop profile for table beet seed in Washington [Online]. L. J. du Toit, C.R. Foss, and L.J. Jones. 1999. Washington State University Extension. MISC 356E. Available at: http://www.tricity.wsu.edu/~cdaniels/profiles/tableBeetPM2.pdf (verified 11 Mar 2010). Cucurbit seed production in California [Online]. M. Murray, T. Hartz, and K. Bradford. University of California Division of Agriculture and Natural Resources. Publication 7229. Available at: http://ucanr.org/freepubs/docs/7229.pdf (verified 4 April 2011). Seed production of open-pollinated tomato lines (tutorial) [Online]. R.T. Opeña, J.T. Chen, T. Kalb and P. Hanson. 2001. The World Vegetable Center (AVRDC). Available at: http://www.agrifoodgateway.com/articles/seed-production-open-pollinated-tomato-lines(verified 15 Aug 2013). General seed production information on the families Allium, Apium, and Brassica [Online]. Undated. Cornell Public Seed Initiative. Available at: http://www.plbr.cornell.edu/psi/seedguide.html (verified 11 Mar 2010). Onion seed production in Idaho [Online]. G.W. Woodbury and C.F. Dietz. 1942. Ag. Exp. Sta. Bulletin 247. University of Idaho. Reproduced online with permission. Available at: http://digital.lib.uidaho.edu/cdm/ref/collection/ui_ep/id/11426 (verified 11 Mar 2010). Onion seed production in California [Online]. R. Voss, M. Murray, K. Bradford, K. Mayberry, I. Miller. 1999. University of California Division of Agriculture and Natural Resources. Publication 8008. Available at: http://ucanr.org/freepubs/docs/8008.pdf (verified 4 April 2011). Vegetable seed production [Online]. H.L. Schudel. 1952. Ag. Exp. Sta. Bulletin 512. Oregon State University. Out of print. Available at: http://ir.library.oregonstate.edu/xmlui/bitstream/handle/1957/15467/Stat... (verified 11 June 2015). Watermelon seed production [Online]. T. Wehner and G. Elmstrom. Undated. North Carolina State University. Available at: http://cuke.hort.ncsu.edu/cucurbit/wmelon/wmhndbk/wmseeds.html (verified 11 Mar 2010). Available for purchase from https://cru84.cahe.wsu.edu/Default.aspx (search for "seed") (verified 11 Mar 2010). 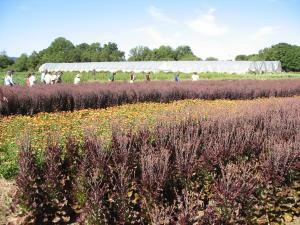 Washington's Small Seeded Vegetable Seed Industry. J. Thomas et al. 1997. Washington State Extension EB1829. The biology of seeds: recent research advances. G. Nicola, K.J. Bradford, D. Come, M. Curie, and H. Protchard. 2003. CABI Publishers, Cambridge, MA. Flower seeds: biology and technology. M.B. McDonald and F.Y. Kwon. 2004. CABI Publishers, Cambridge, MA. Hybrid seed production in vegetables: rationale and methods in selected crops. A.S. Basra. 2000. Food Products Press, New York, NY. Principles of seed science and technology. L.V. Copeland. 1976. Burgess Publishing Company, Minneapolis, MN. Seed production principles and practices. M.B. McDonald and L.O. Copeland. 1997. Chapman and Hall, New York, NY. Seeds handbook: biology, production, processing, and storage. B.B. Desai, P.M. Kotecha, and D.K. Salunkhe. 1997. Marcel Dekker, Incorporated, New York, NY. Vegetable and flower seed production. L.R. Hawthorn and L.H. Pollard. 1954. Blackiston Co., New York, NY. Out of print. Vegetable seed production. R.A.T. George. 1999. CABI Publishing, New York, NY. The wisdom of plant heritage: organic seed production and saving. B. Connolly and C.R. Lawn. 2005. Northeast Organic Farming Association of New York. (Available for purchase at http://nofany.org/publications.html) (verified 11 Mar 2010). Farmers’ seed production: new approaches and practices. 1999. C. Almekinders and N. Louwaars. Intermediate Technology Publications. Collecting, processing and germinating seeds of wildland plants. 1986. J.A. Young and C.G. Young. Timber Press. Portland, Oregon.